Well, I got the string served and lightly waxed, and I went out and put a couple dozen shots through it... wore some extra eye/hand protection just in case. She didn't blow up on me so far, so I think I'll smooth out the handle and pretty her up a bit (was thinking of trying out the vinegar/steel wool stain I saw on here) and start putting in some range time with her. Final stats: 63.5" ntn, ~8.5" non-bending handle, ~1.75" set just unbraced (a touch better than my last red oak board, but in the same ballpark), pulls 43# @ 28", a little over 48# @ 30"
Hah! I'm already hooked. Once I get some hickory, I'll be completely sunk! Yep, my signature says it all. Very nice looking tiller on that red oak. Good job! So... any thoughts on why this bow now pulls lighter than when I finished tillering? I just checked again after I finished most of the sanding, and I'm only getting 38# @28" now. Scratching my head... and pretty aggravated because this was going to be my hunter and now it's below legal weight. I've never actually made an oak board bow yet but think you did a dandy job with this one by the pictures you showed of tiller etc.Well thought out progression.Congratulations. 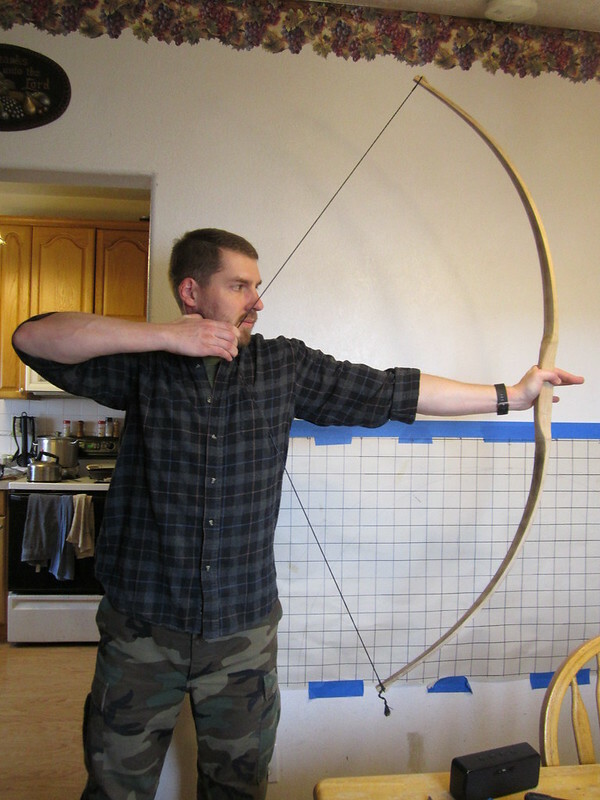 I'm probably coming in here a bit late but for poundage increase once on a KCT bow from a stave I used 12 ply linen string laid on in lengths next to each other to gain 7 pounds of draw weight.If I remember right a total of 28 strands.It made the bow practically indestructable also.It was on a bow about as wide as yours.I think 1 and 5/8" wide at fades to begin with but with parallel limbs.I used smooth on epoxy but I bet TT3 would do the job for glue too.You would'nt need to wait too long to see resullts using the epoxy.Maybe a couple of weeks using the TT3.Faster with smooth on of course as there is not as much moisture in it as TT3.It won't give you any more reflex etc.Just actual poundage increase.Just a suggestion. I've got a whole slew of that linen string if you would like to try that. To late now I guess. But I learned to tiller to my draw weight and stop an inch short of my draw length. I also do a lot of sanding so I don't have tool marks to remove at the end.